In April, this day marks the beginning of the Hindu solar new year. In fact this day is celebrated all over the country as new year day under different names. It is also the time when the harvest is ready to cut and store or sell. For the Sikh community Baisakhi has a very special meaning. It was on this day that the last Guru Gobind Singh organised the sikhs into Khalsa or the pure ones. By doing so, he eliminated the differences of high and low and established that all human beings were equal. Baisakhi has special significance for two of India's major religious groups. For Hindus, it's the start of the new year, and is celebrated with requisite bathing, partying, and worshipping. It's believed that the goddess Ganga descended to earth thousands of years ago, and in her honour many Hindus gather along the sacred Ganges River for ritual baths. The action is centered in the holy cities along the Ganges in north India, or in Srinagar's Mughal Gardens, Jammu's Nagbani Temple, or anywhere in Tamil Nadu. Hindus plant poles wrapped in flags of god-embroidered silk in front of their homes, and hang pots of brass, copper or silver on top. Children wear garlands of flowers and run through the streets singing "May the new year come again and again!" In Kerala the festival is called Vishu, and includes fireworks, shopping for new clothes and interesting displays called Vishu Kani. These are arrangements of flowers, grains, fruits, cloth, gold, and money are viewed early in the morning, to ensure a year of prosperity. In Assam, the festival is called Bohag Bihu, and the community organizes massive feasts, music, and dancing. Sikhs assign quite a different meaning to Baisakhi, and if you happen to be in a Punjabi village to catch the men performing the wild bhangra dance, you'll get the picture. This strenuous dance tells the story of the agricultural process, from tilling the soil through harvesting. As the dholak (drum) changes beats, the dancing sequence progresses, dramatizing plowing, sowing, weeding, reaping, and finally celebrating. Baisakhi also commemorates the day in 1689 when Guru Gobing Singh founded the Khalsa, the fighting Sikh brotherhood that donned the distinctive Sikh outfits. Sikhs visit temples, such as the Golden Temple in Amritsar, where the holy Granth is read, commemorating the day on which the Guru asked five volunteers to offer their lives, then took them one at a time into a tent. He emerged each time with a bloody sword, although he had in fact sacrificed a goat. In honor the "Beloved Five," a series of parades are held, in which sets of five men walk in front of the holy book with swords drawn. When the ceremony is over, a round of feasting, music-making, and dancing begins, amid the blossoming flowers and harvested grain. Baisakhi, marks the beginning of New Year, particularly in the northern part of India. It is among the few Indian festivals that has a fixed date. Baisakhi is always on April 13th. In Kerala, Baisakhi is called as "Vishu" and in Tamil Nadu, it is celebrated as "Puthandu". Considered a holy day, the devout celebrate the Baisakhi with a dip in the holy rivers just around the break of dawn. It is on this day that Sun enters Aries, the first sign of Zodiac. This signifies ushering of the new year. In Punjab (the land of Green Revolution) particularly and in the northern belt of India in general, farmers perform their own prayers and rejoice. For on this day, they commence cutting their harvest. The fields can be seen full of nature's bounty. 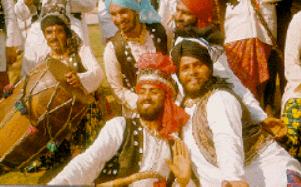 Dressed in their typical folk attire, both men and women, celebrate the day with Bhangra and Gidda. Sweets are distributed, old enmities are forgiven and life is full of joy, merriment and everyone seems to belong. The above two are the main reasons for celebrating Baisakhi. Baisakhi, however, has had a new dimension added to it by Guru Gobind Singh. For it was on the day of Baisakhi in 1669, that he established the Khalsa Panth and gave a final impetus to the course of the earlier nine Gurus of Sikhism.